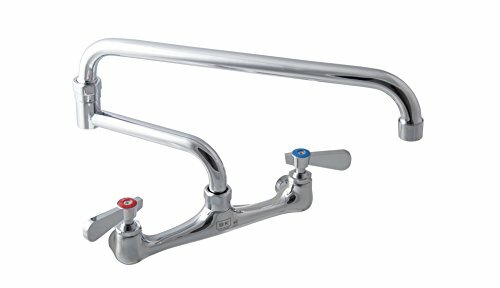 This WorkForce Standard Duty Faucet is ideal for commercial settings. This faucet features an 18 inch double jointed swing spout and an 8 inch on center splash mount. The faucet has a high polished chrome finish, 1/4 turn ceramic cartridges and color-coded hot and cold indicators. This faucet is lead free, NSF and cCSAus certified and carries a one (1) year Manufacturer's Warranty against any defects. Offered by BK Resources: a leading supplier of Stainless Steel products, plumbing supplies, commercial gas hoses, and refrigeration. BK Resources strives to develop products that are built to last, save time, increase efficiency and offer value to the end user. BK Resources products can be found in leading restaurants, bars and night clubs, universities, stadiums and food trucks nationwide.